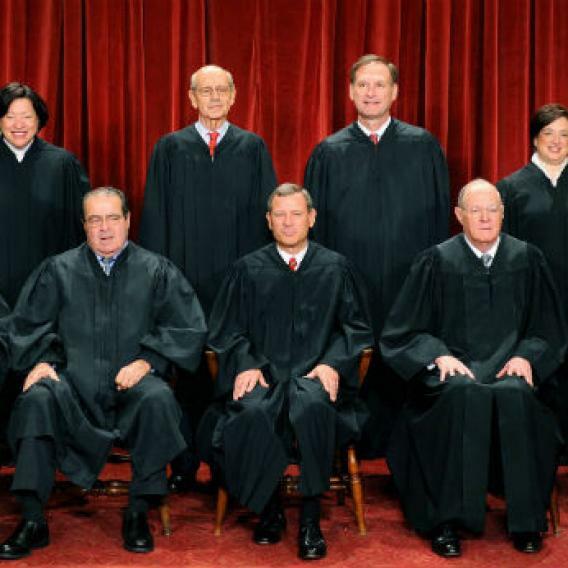 The Supreme Court’s Citizens United decision has led to an explosion of campaign spending. If you aren’t sure Citizens United gave rise to the super PACs, just follow the money. Photograph by Tim Sloan/AFP/Getty Images. Most of what you hear about Citizens United v. FEC is negative. By opening the door for corporations to spend unlimited sums in elections and to allow for the creation of super PACs, the Supreme Court has made a campaign finance system that was already flooded with money much worse. But Citizens United obviously has its defenders, and they have advanced a number of arguments to try to blunt criticism of the Supreme Court’s controversial decision: The public actually learns from the flood of negative advertising coming from these super PACs; super PACS increase competition; The Supreme Court’s Citizens United decision didn’t create super PACs, so stop blaming the court for the flood of dollars and the negative campaign ads they buy. This last argument has recently gained a lot of traction, and has been made by First Amendment lawyer Floyd Abrams, his son the legal commentator Dan Abrams (who accused the media of “shameful, inexcusable conduct” in describing the Citizens United-super PAC connection), columnist George Will, and the Atlantic’s Wendy Kaminer. The argument goes like this: The Supreme Court back in 1976 held that individuals had a constitutional right to spend unlimited sums on elections. And before Citizens United, rich individuals like George Soros gave large sums of money to so-called “527 organizations” (named after an obscure section of the tax code) with innocuous names like “Americans Coming Together.” These 527 organizations were just like super PACs, so there’s nothing new here. This line of attack is so strong and insistent that the New York Times public editor, Arthur Brisbane, felt it necessary to weigh in on whether the paper’s stories tying Citizens United to super PACs were fair. (He concluded they were, but that the truth was complicated.) The purpose of the drumbeat appears to be to insulate the Supreme Court from further criticism of the Frankenstein’s monster they’ve created. It is true that before Citizens United people could spend unlimited sums on independent advertising directly supporting or opposing candidates. But that money had to be spent by the individual directly. It could not be given to a political action committee, which had an individual contribution cap of $5,000 and could not take corporate or union funding. In many cases, wealthy individuals did not want to spend their own money on advertising, which would say “Paid for by Sheldon Adelson” or “Paid for by George Soros,” so fewer of these ads were made. The only way to avoid having your name plastered across every ad was to give to the 527s, which claimed they could take unlimited money from individuals (including, sometimes, corporate and labor union money) on grounds that they were not PACs under the FEC’s definition of PACs. These organizations were somewhat successful, but a legal cloud always hung over them. During the 2008 Democratic primary season, Bob Bauer, candidate Obama’s lawyer, barged in on a pro-Hillary Clinton conference call to say that people giving to 527s to support Clinton could face criminal liability. After Citizens United, the courts (most importantly in Speechnow.org v. FEC) and the FEC provided a green light for super PACs to collect unlimited sums from individuals, labor unions, and corporations for unlimited independent spending. The theory was that, per Citizens United, if independent spending cannot corrupt, then contributions to fund independent spending cannot corrupt either. (I am quite critical of this theory about corruption, but that’s besides the point here.) So what was once of questionable legality before the court’s decision was fully blessed after Citizens United. But this logic has not stopped the Citizens United defenders from making their claims that there’s no connection between the case and the emergence of super PACs. So let me try something different: a look at the numbers. Let’s focus only on presidential election years, to keep the comparisons as simple as possible. In the 1992 election season, when it was entirely possible (under that 1976 Supreme Court decision) for Sheldon Adelson or George Soros to spend unlimited sums independently on elections, total outside spending up to March 8 was about $1.5 million. In 2000, total outside spending up to March 8 was $2.6 million. In 2004 and 2008, with the explosion of 527 organizations, total spending to March 8 was $14 million and $37.5 million. What is the total for this election season through March 8? More than $88 million, 234 percent of 2008’s numbers and 628 percent of 2004’s. * If this was not caused by Citizens United, we have a mighty big coincidence on our hands. With House and Senate seats also in play, and control of each chamber potentially up for grabs, we are likely to easily eclipse the total $301 million spent by outside groups in the entire 2008 election. How do I know? In 2010, a midterm congressional election year—when you would expect to see a dip in spending compared to a presidential year—total outside spending hit a record $304.6 million. It was an incredible number for a midterm election season. Why did that happen? Citizens United was decided early in 2010.